Nokia, now a part of Microsoft Mobile, is not going away easily although the iconic image the company held years back is far gone (check out the Iconic Nokia Phones from the past). 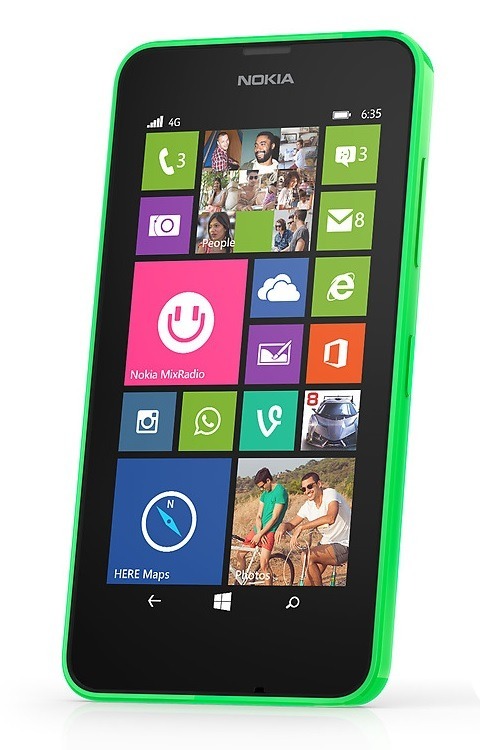 Their latest announcement was about the Nokia Lumia 635, a smartphone in the budget range which had features worth a clap, while there were some compromises too, but in the end, the Lumia 635 is coming packed in with enough horsepower under the bright display and in an attractive price for what it offers. Usually for most of the Nokia Lumia devices, there is a dedicated camera button, but that is missing here in the 635, and the camera on the back isn’t assisted with a flash, so its clear that Nokia hasn’t kept much for the photo enthusiasts in this, but we still know that Nokia doesn’t include useless camera optics. The most interesting part in the Lumia 635, for sure is the Windows Phone 8.1, with this being the first phone to come with the latest Windows Phone OS out-of-the-box, and it would have the inclusion of Cortana, the personal voice assistant which was announced to compete the Google Now and Siri (in the Android & iOS devices), and there is an advanced notification center included in the new OS. To enhance the user experience, Nokia includes the HERE Drive, HERE Maps, and Nokia Mix Radio in the OS pre-installed. We have much to tell about the OS which has quite some advancement, as the features include: Word Flow (alternative to swipe), Action Center to receive all the notification, social updates etc., 7GB free cloud storage with Microsoft OneDrive, Microsoft Office (we always look for ways to open and edit the files in other OS, but here it’s Microsoft product, thus compatibility at max). One can now add the colors of the live tiles, and even add a background. Design wise it’s the same colorful sharp-edge body, and the Nokia X wasn’t looking any different than this, but the screen size is 4.5-inch, with the WXVGA Clearblack IPS LCD display (480×854 pixels resolution), and the display has got the Corning Gorilla Glass 3 protection. Under the hood, there is still a neat Snapdragon 400 chipset clocking at 1.2 GHz, but the 512 RAM should be a bit of concern, limiting the multitasking but this combination should be quite enough because Windows Phone OS doesn’t really need much power to run with ease. The 5MP rear camera doesn’t come with much support but still, offers 720p video recording at 30fps, and there’s nothing really special for the ones who love to take photos frequently. The battery included in the Lumia 635 comes with the capacity of 1830mAh, which as the company claims, is good enough to give over half a day of talktime on the 3G network. While the Lumia 635 comes with the 8GB internal storage, the phone has got the MicroSD card slot with the storage expansion possible up to 128GB. While the partner version which was announced along with this, the Lumia 630 comes with the 3G connectivity, the Lumia 635 is a bit advanced, with the 4G LTE connectivity based on the availability. The entire list of connectivity options are as listed below. For someone considering a Windows Phone device and not an Android one (forget iOS, because its accessories are available at such price), the Lumia 635 should be a good choice when it is released into the market. Considering that it is coming with the latest Windows Phone OS with the voice assistance, the LTE network and a simple design, this should be selling like hot cakes, just like the other low-end Lumia 520 did in the past, and it did deliver what was promised. To make it clear, the acquisition of Nokia by Microsoft doesn’t mean that things are going to change in a rapid way. We are assured by the NokiaHelps twitter account that the support for the devices is going to stay the same, so don’t have double thoughts before choosing a Nokia phone, just like many did after the Motorola acquisition by Lenovo, until the latter clarified about the after-sales service to the customers. The Nokia Lumia 635 is going to be available through AT&T, T-Mobile, MetroPCS in the US, and around the world, it should be selling in several markets where the company has already got its presence. The pricing of the Lumia 635 is expected to be around $189 in the U.S., and this is for an unlocked unit, so if some carriers are selling this with any prepaid plans, you might be able to get a great deal. The color options in which the Lumia 635 will be available, include orange, green, yellow, black and white, and these are all coming with the glossy back.